The new Rainbow Six Vegas 2 Trailer is now available in the 360-Hq Videos/Trailers area. Scheduled for a March 2008 release and developed by Ubisoft’s award-winning Montreal studio, Tom Clancy’s Rainbow Six Vegas 2 is the sixth iteration of the multimillion-selling Rainbow Six tactical shooter franchise and follow-up to the highly successful and award-winning Rainbow Six Vegas. Watch the Rainbow Six Vegas 2 Video Now! Tom Clancy’s Rainbow Six Vegas 2 is the last chance for gamers to rescue America’s sexiest city from an escalating terrorist siege that will impose heart-pounding action from beginning to end. The best are back and this time winner takes all. 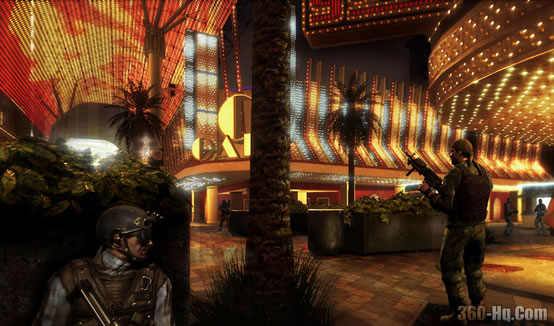 The highly-anticipated sequel to the recipient of numerous awards, including 2006’s Best First Person Shooter and Best Online Game, Tom Clancy’s Rainbow Six Vegas 2 will push the top-selling franchise to new heights with new gameplay features and groundbreaking co-op and multiplayer modes. Use the Xbox Live Vision to create a character with your appearance. Create your own custom camouflage. Achieve the rank of Private First Class.